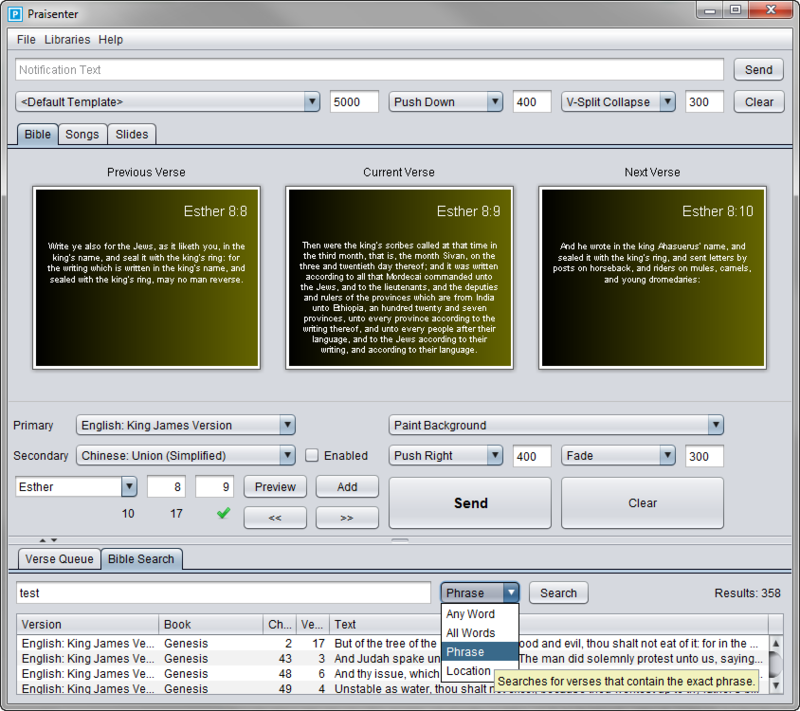 Praisenter is packed with features that make presenting content easy and manageable. Don’t have time to read? View some screenshots. 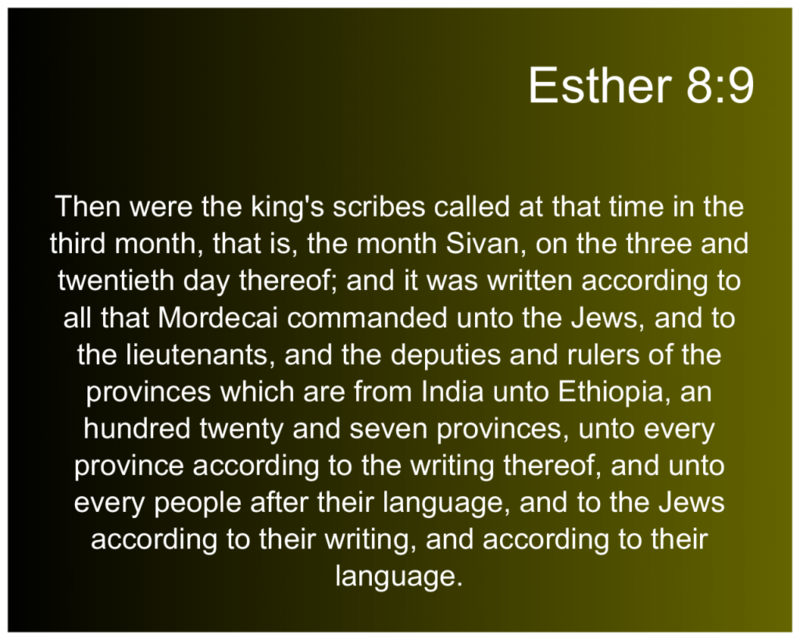 Search or location Bible verses with ease and quickly present them. Follow a speaker with simple verse navigation and previous, current, and next verse previews. 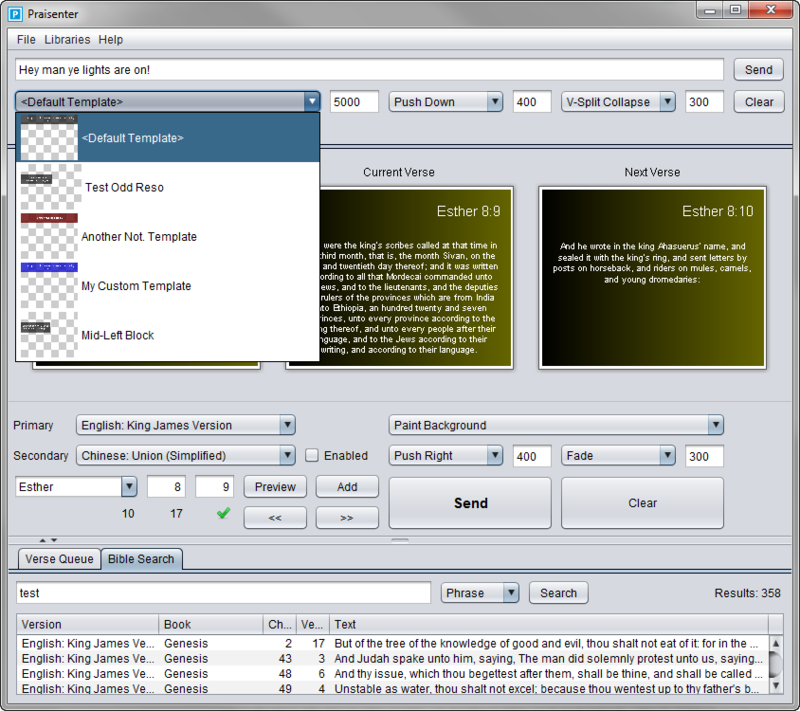 Search the bible for phases, words, or location quickly with highlighted matched text. Save a list of verses for planned scripture reading. Install and manage new bible translations from The Unbound Bible. 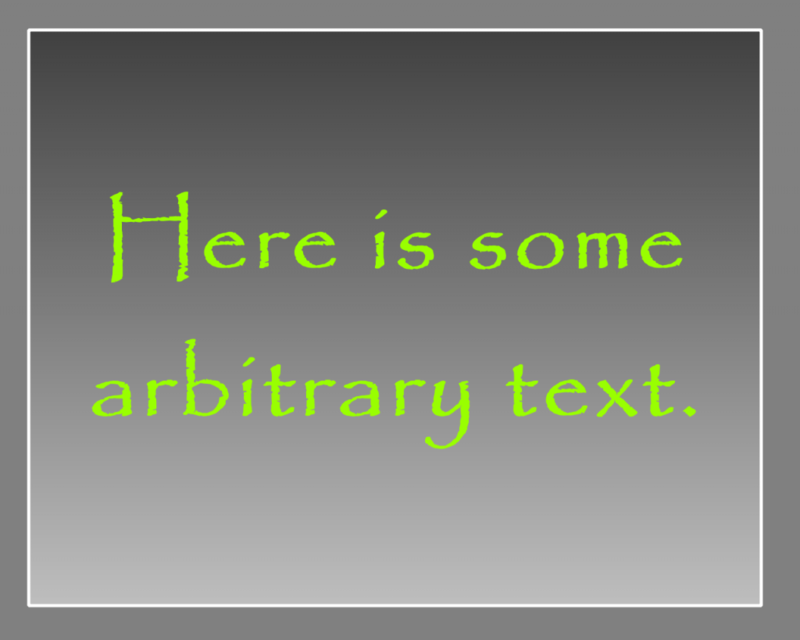 Display up to two translations at the same time to support multilingual services. Add, edit, delete, and search songs quickly. 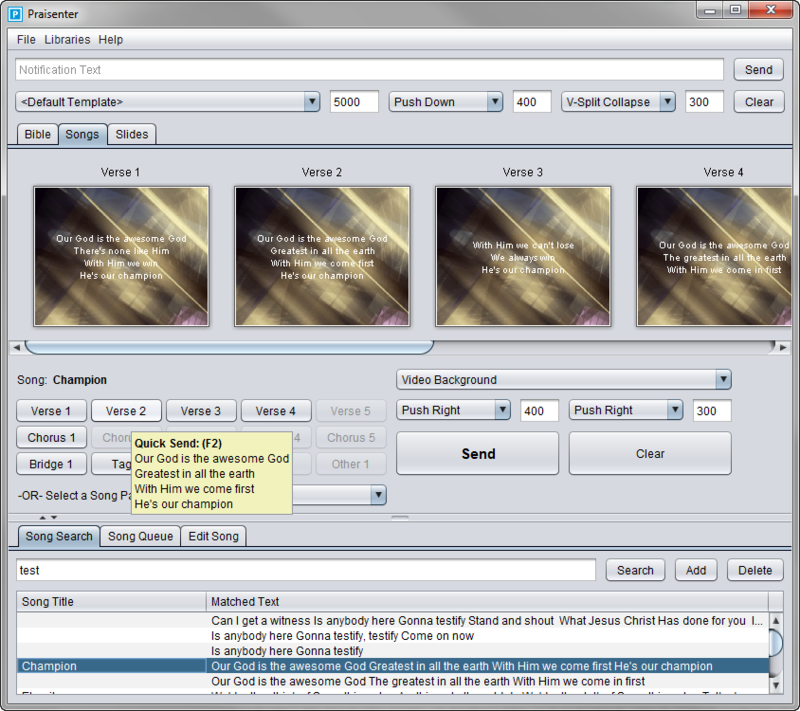 Quickly present common song parts with the Quick Send panel and hot-keys. Got a song with a million verses? 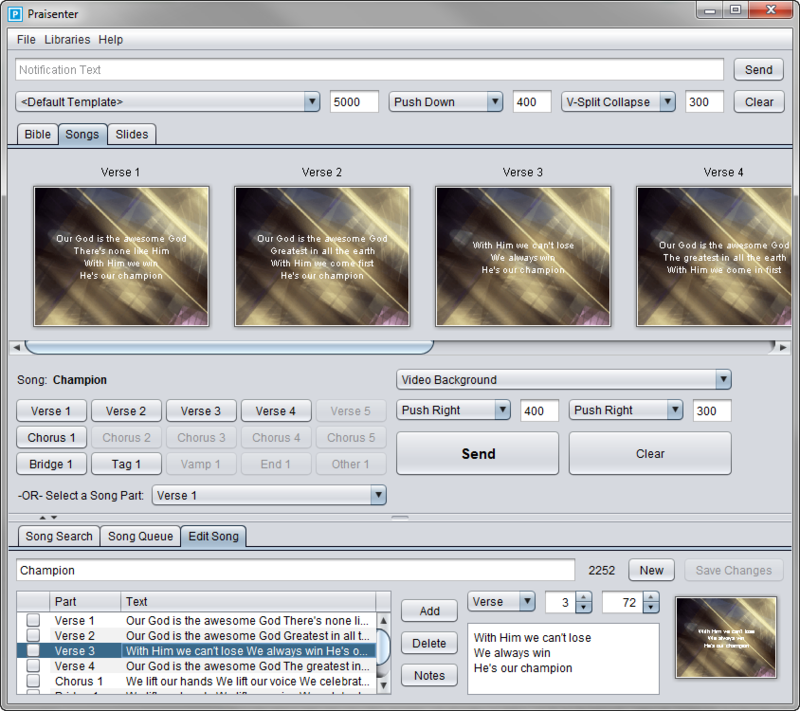 You can add them all, with the unlimited number of song parts feature. Make sure the song is ready for presentation by scanning the entire song preview at once. Store a list of songs for quick song transitions. Search everything about a song, and view a list of highlighted matched text for faster searching. 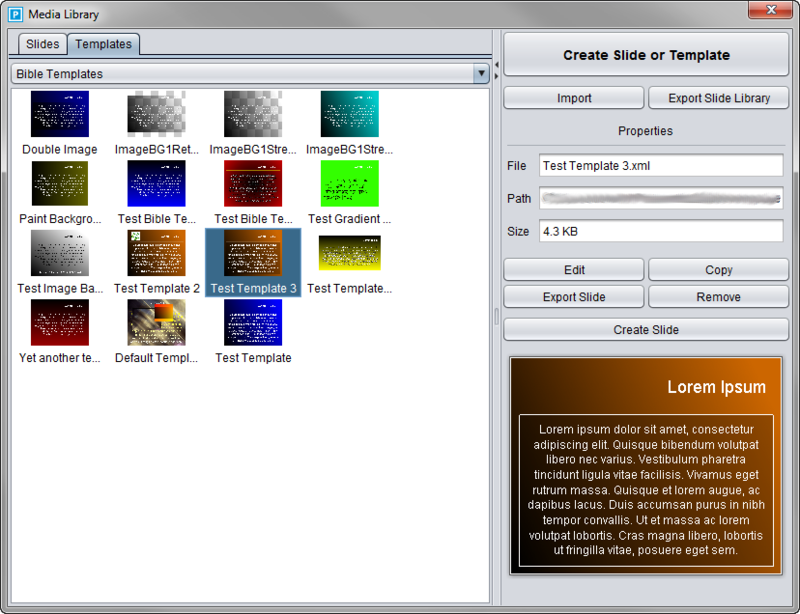 Create, edit, delete custom slides that contain any type of content. Preview the slides for one last check of correctness. 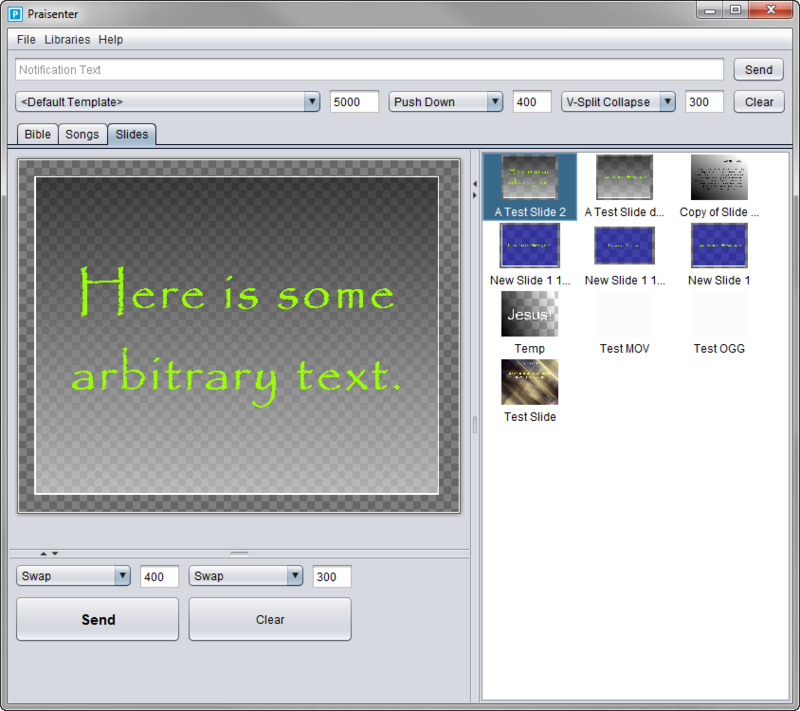 Fully customize the display of content. 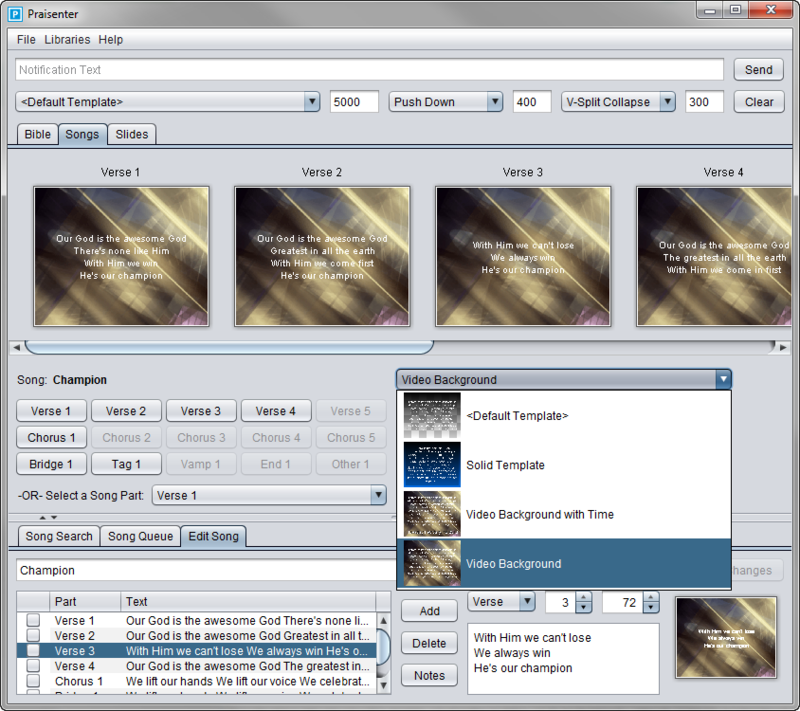 Create custom templates for Bible and song presentation and quickly swap between them. Create fully custom slides to present other content. Use the new Slide/Template editor to customize every aspect of a slide or template, including video looping, text outline, gradients, and more. Support for full or partial transparency. 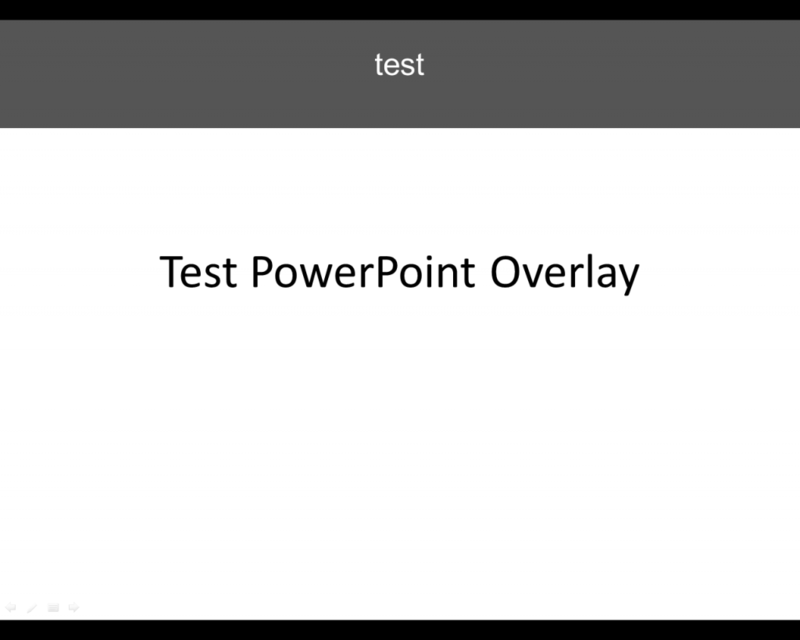 Easily create slides from any template and copy any slide or template. Create slides and templates on one computer, export them, then import them into your main computer along with any attached media. Add images and pictures, audio, and video to any slide or template. Specify properties like audio looping, video muting, image scaling, borders and more. 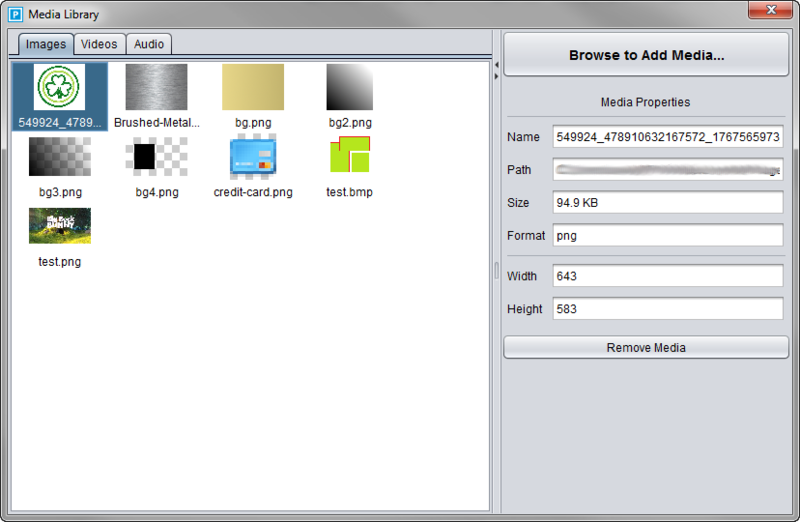 Use the simple Media Library to store your media in one place for easy access. Support for nearly every audio/video format and codec using the Xuggler library (which uses FFmpeg under the hood). Use videos and pictures any where on a slide or template; whether as a background or another floating component. You are not limited to any media offered by Praisenter. Use any saved pictures, audio or video. Transition from slide to slide using any of the many transitions provided. Full control of the in and out transition and its duration is provided. Configure an easing to make your transitions pop. 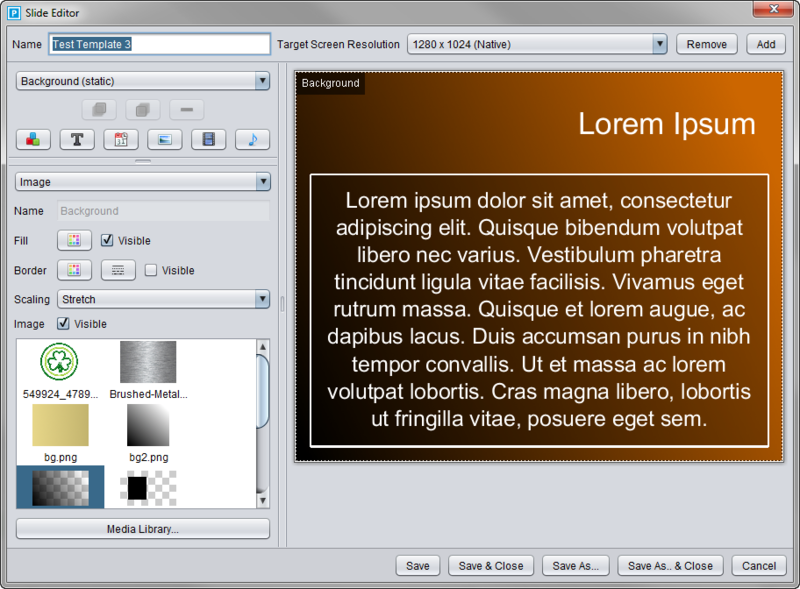 Enable smart transitions to keep any slide or template backgrounds stationary while the content is transitioned. 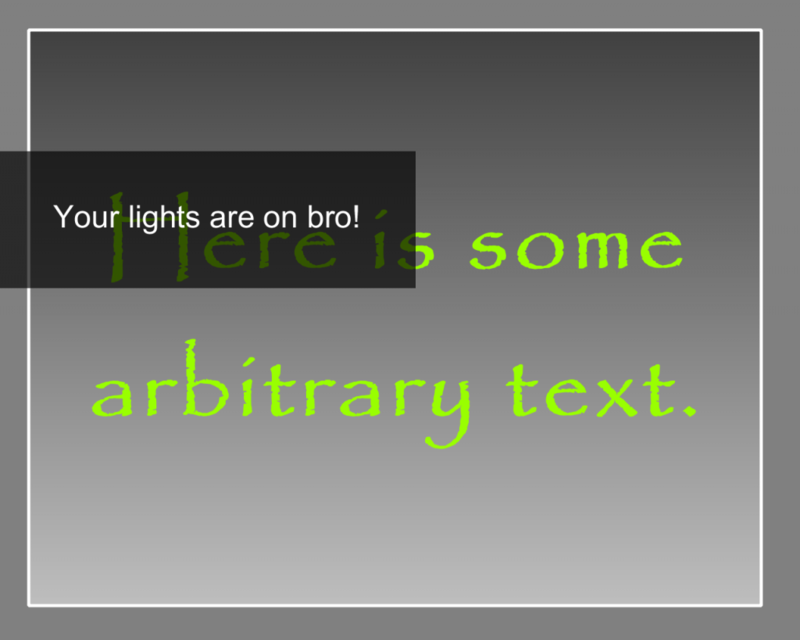 Did some one leave their lights on? No matter what the occasion, you are given quick access to notifications. 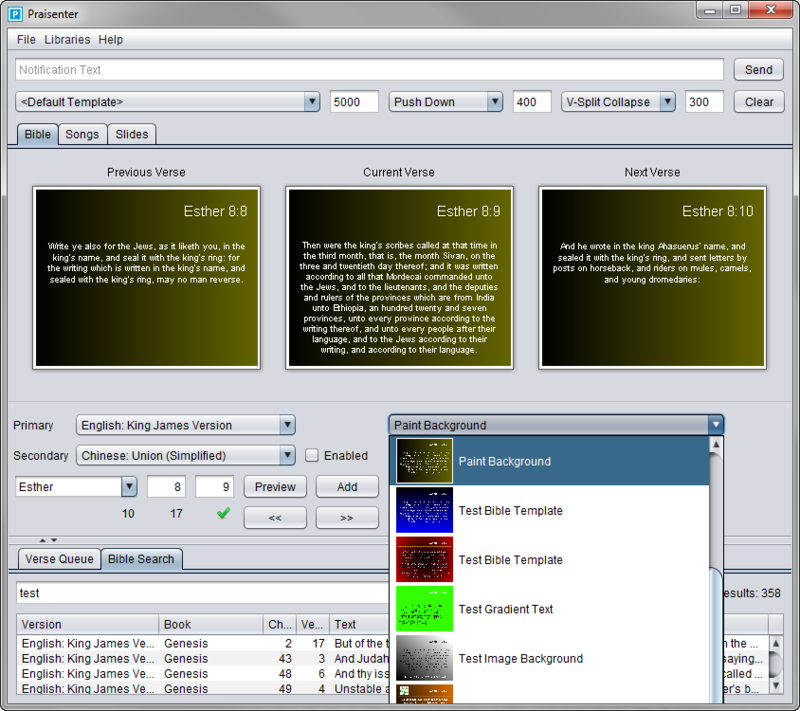 Notifications, just like Bible verses and song lyrics, have completely customizable templates along with the same transition support. Don’t like where the notification displays on screen? Move it anywhere on the screen to get maximum effectiveness. Really want some graphics on the notification, no problem, use the Slide/Template Editor to add any graphics, sound, video, text, and more to a notification template. Set the notification wait period to force the notification to close automatically or clear it manually. 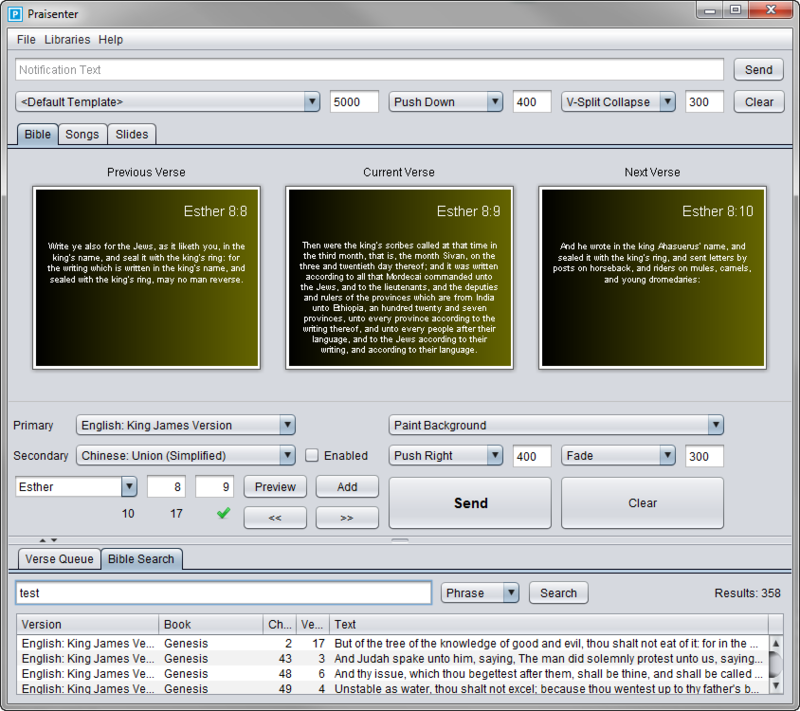 Configure Praisenter to best suit you by setting up default Bible translations, templates, transitions, and more. 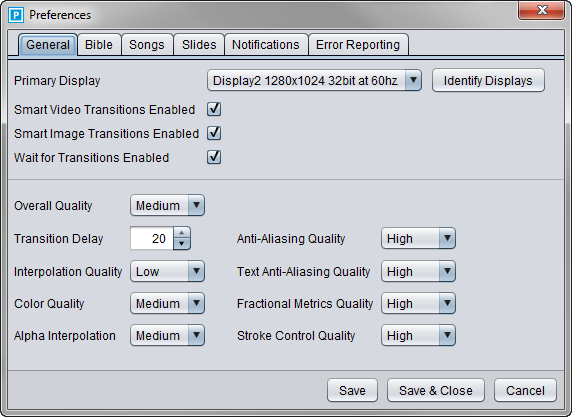 Modify the quality settings to improve performance or quality. Setup automatic error reporting for faster turn-around time on issues. A picture is worth a thousand words, so here are some pictures highlighting the major features.